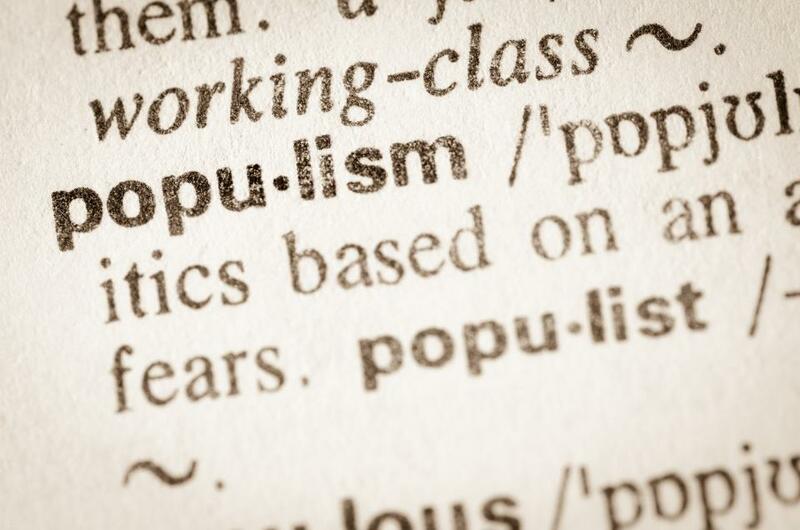 In anticipation of our Workshop on Populism and Constitutionalism on 20 November (info & sign up here) we are publishing a series of blog posts in which the speakers will outline their thoughts on the topic. We are starting off with Julian Scholtes, LLM Researcher at the EUI, who goes on a deep dive into the constitutional theory of populism, reflecting on the concept of constituent power. Political populism appears to be omnipresent nowadays. From Viktor Orbàn’s pledge to ‘build an illiberal state’ in Europe to Narendra Modi in India and Rodrigo Duterte in the Philippines, populists are challenging constitutional democracy everywhere. When confronting populism, one question that we need to ask is: how come populists are so successful in this? The answer, to my mind, lies quite deep: populism attacks public law at its root – at its conception of constituent power. It is not the specific political ideas that populists disseminate, be they on the left or on the right, are what pose the main threat to constitutionalism. Rather, the threat lies in the way populists frame their ideas within a specific conception of how political power is generated. Populists can attack constitutionalism because of the deficient conception of constituent power that underlies the latter. In the absence of a strong constitutional culture that anchors constitutionalism within society, constitutionalism seems like a lost enterprise. Populists challenge constitutions, because they believe that the democratic mandate supersedes constitutional legality. Accordingly, constitutions are drawn into the political sphere through aggressive constitutional politics – they become a political topic like any other. The very core idea of constitutionalism – that constitutions should constrain politics – can only work if politics is willing to be thus constrained. In the absence of a strong constitutional culture that anchors constitutionalism within society, constitutionalism seems like a lost enterprise. This is problematic for lawyers, because lawyers love thinking in terms of legality. They take comfort in the myth “that an answer to any issue can be found in the law”.1 Accordingly, they take the law as a given and presume the existence of the constitution as the most natural thing in the world. However, constitutions cannot be taken for granted. Where populism erodes their authority, they often fail to bridge the gap between validity and effectiveness. Constitutions – as constitutional text – thus do not seem to be a sufficient scope for thinking about the relationship between populism and constitutionalism. We must move beyond (or, rather: before) the constitution: to the concept of constituent power. Constituent power is the power to make constitutions. The constitutionalist and populist conceptions of constituent power are fundamentally different from one another. And, as I will argue, the reason constitutionalism is so vulnerable to populism lies in its conception of constituent power. Constitutionalism can only wield real authority if it recognises the weaknesses of this conception. Normativism, the constitutionalist conception of constituent power, goes back to the Austrian legal theorist Hans Kelsen. For Kelsen, the question of constituent power vanishes once an order is constituted. Norms derive their validity from other norms, and anything that stands outside the system of norms is incapable of affecting this system. Even new constitutions are always founded on and derive their legality from prior constitutions. Constituent power, for normativists, is akin to the unmoved mover or the big bang of a legal system. It must have been there, but that is all there is to it. What matters is what it set in motion. Normativism is the basis of the processes of constitutionalisation that have taken place over the past decades. Post-war European constitutionalism strived to ‘lock away’ certain parts of public life from the political sphere. Similarly, the Europeanisation of public law has taken place by judicial rather than democratic or political means – above all through the jurisprudence of the European Court of Justice. Normativism is the conceptual foundation for these developments. If previously political issues could be constitutionalised, who is to say that the reverse is impossible? One can see how the normativist conception would run into problems when confronted with claims of ‘popular sovereignty’. Normativism diminishes the need for constituted order to be somehow democratically founded. Democracy cannot step outside the frame of the law and exercise constituent power, because constituent power, through the normativist lens, has vanished once an order is constituted. There is a complacency in the legality-based normativist axiomatic that can be easily exploited. If previously political issues could be constitutionalised, who is to say that the reverse is impossible? The idea that, by framing certain parts of public life as constitutional, they could be entirely locked away from the reach of politics is naive and formalistic. Populists can exploit this complacency by juxtaposing a Schmittian, decisionist conception of constituent power. Decisionism, or: Is the frame part of the canvas? Populists can present the deconstruction of a constitution as a democratic exercise in its purest form. Democracy, for decisionists, is the basis of the constitution, as opposed to the constitution being the frame for democracy. Constituent power does not recede once an order has been constituted. It remains present within the constituted order. The transformation of constituent power into constituted power thus does not signify any kind of irreversible change. A constitution is simply an expression of the political will at a certain point in time. For decisionists, constitutions are not the frame of politics: they are part of the canvas. Populism is, albeit implicitly, founded on this decisionist conception of constituent power. On the basis of decisionism, populists can present the deconstruction of a constitution as a democratic exercise in its purest form. Ignoring court orders and packing courts in defiance of the constitution, as is taking place in Poland, can be presented not as a constitutional transgression, but an exercise of sovereignty – a democratically legitimate decision partially re-founding the constitutional order. Similarly, there is no need for new constitutions to connect to previous ones. The preamble of the new Hungarian Constitution explicitly declares the Constitution of 1949, in force until 2011 “invalid”, potentially leading to invalidity of all previous laws and Constitutional Court case law based on it. Populists, in their own view, are not ‘politicising the constitution’ – they are simply exercising the constituent power that was naturally vested in the people in the first place. How do constitutionalists reconcile their democratic aspirations with the simultaneous preclusion of certain political choices from the democratic realm? How can the people be sovereign, but at the same time not exercise their sovereignty? The uncomfortable truth is that normativism does not have an answer to these questions. It simply “marginalises the significance of democratic foundation”, assuming that the order is constituted and there is no escaping it. 7 Populists can use this deficiency of normativism to exploit the human condition of indeterminacy in its most radical legal form: as the people’s constituent power. Within constitutional democracy there inheres a tension between constituted and constituent power, between people and institutions, between democracy and law. Constitutionalists must ultimately accept that this tension cannot be resolved through legal means. Populism creates a political discourse that extends beyond its legal frame, but the legal frame is unable to contain this discourse. The political realm extends into constitutional matters, despite all efforts of constitutionalists to shield them from it. To believe that constitutional rigidity would be able to contain the tension inherent in modern constitutionalism is illusory. At worst, it only exacerbates the tension. Constitutionalists must stop believing that the reasons on which constitutionalism rests are self-evident, and instead start embracing these reasons in political engagement. These Verfassungsvoraussetzungen – constitutional prerequisites – are what lies at the heart of constitutionalism: The liberal constitution cannot guarantee its own existence, because it rests on conditions prior to it and thus out of its own reach. We should concede that Schmitt had a point in arguing that the people continue to be present within the constituted order as a constituent power. If they do not share the values and believe in the tenets of constitutional democracy, then constitutional democracy cannot survive. The tension inherent in constitutionalism can thus only be alleviated, but never be resolved. The emergence of populism as a political force does not create any new tensions, it merely highlights the tension that is inherent in constitutional democracy in the first place. But this does not imply that constitutionalists must surrender to populists. Rather, they must abandon the ‘complacency of legality’ and embrace public law in public discourse. Legality can only operate within a positive frame. Where this frame is being rejected by participants in political discourse, constitutionalism must be justified by reasons prior to legality. In an era of political populism, constitutionalism is a discourse. As such, it has a powerful role to fulfil in dismantling the populist threat. Is There Such a Thing as Populist Constitutionalism?